1. First, make sure your location is good for a fire. The best location for a fire is a dry, flat surface. It should be protected from wind and close to your shelter, a water source, and firewood. 2. Clear the area you will use for your fire. 3. Dig a pit 4-6 inches deep and 3 feet across. 4. Collect firewood of a variety of sizes ranging from large logs to small sticks. 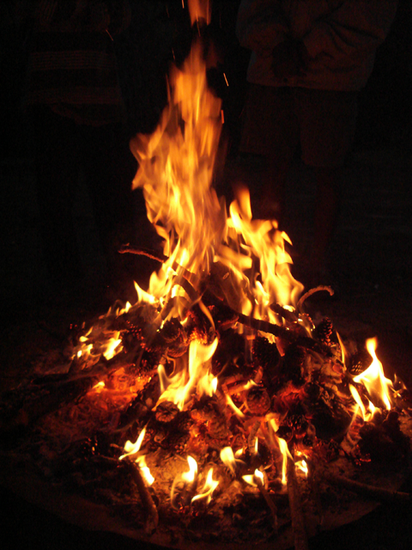 There are many methods to starting a fire and it all depends on your resources. Here are methods used to start a fire when on a stranded island. 1. Make sure the sun is out. This method will work only in daylight. 2. Get a magnifying glass. If this is not available, use a disassembled camera lens or binoculars. 3. Angle the lens so the sun concentrates on one area, making it heat up. It should begin to smoke immediately. 4. Blow on the tinder to ignite the fire and add smaller twigs until the fire is steady. 1. Get a battery and some wire. Without these two things, this method will not work. 2. Attach two pieces of wire to each side of the battery. 3. Touch the wires together above the battery and wait for it to spark. 4. Pick up the tinder and blow on it. 5. Once it lights, quickly put it in the fire pit and add smaller twigs. 1. Find a pie­ce of softwood for your plow board, about 18 inches long by 2 inches wide. 2. Use a knife or the edge of a rock to carve a groove 1 inch wide and 6-8 inches long in the center of your plow board, about two inches from either end. 3. Find a hardwood stick for your plow. It should be about a foot long and come to a point on one end. 4. Lay the board flat on the ground and insert the plow into the groove. 5. Rub the plow back and forth with moderate pressure to create small bits of wood dust. 6.Once you have a moderate amount of dust, raise the top end of the board up and rest it on your knee. The dust will collect at the bottom. 7. Rub as fast as you can with heavy pressure until the dust smolders. Pick up the board and gently blow until you have a flame you can transfer to your tinder. There are many other ways you can start a fire, but these are the best techniques for success.